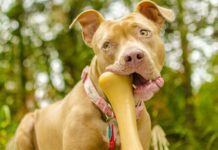 Before we can talk about the temperament of Pit Bulls we have to first understand what temperament means. Temperament can be defined as an individual’s way of behaving or reacting to specific situations. Reactions can include fear, shyness, aggressiveness, curiosity, courage and willingness. 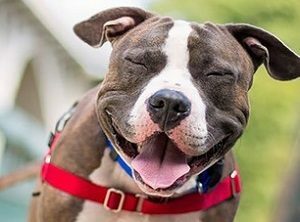 Whether you are rescuing a Pit Bull or buying a puppy from a breeder, temperament is the most important factor to consider when making your choice. 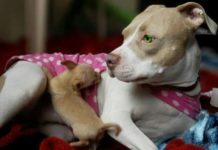 One reason people choose to rescue a Pit Bull instead of buying from a breeder is when you adopt an adult you know their temperament and you can be certain of their behavior and reactions to general situations. Puppies do not come with this benefit. You could bring home the best looking puppy in the litter that reacted to you with love and tenderness, but at the age of 2 will they still have that same temperament? The answer is no. Life experiences will shape their behaviors and reactions to certain situations. Temperament is shaped through genetics and life experiences. How a 4 month old puppy reacts to a situation might not be the same reaction when they are 3 or 4 years old. Even if you have the best looking dog on the block, if you didn’t give temperament the weight it deserves you could have a great looking dog that has horrible temperament and is a burden to the breed. Proper Pit Bull temperament is easily identified as is poor temperament. Strong nerves. A Pit Bull that shrinks or panics when confronted with loud noises or unfamiliar situations is showing weak nerves. 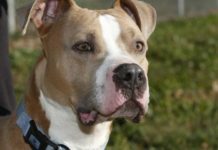 Pit Bulls with proper temperament will show strong nerves in unfamiliar situations and their reactions to strange sounds, while at first might be fearful, will quickly turn to investigation the noise. Friendly and outgoing. Even with strangers they have never met they will show an out-going nature and be willing to engage in fun with a total stranger without caution. In short, they love all people. I would like to note that a dog that shows fear towards any person was either not socialized correctly or in the case of a rescue dog may have been abused. Even when abused, a correct Pit Bull will still except strangers without much fuss though. Submissive, but not overly so. A correct Pit Bull should be willing to submit to you willingly and not be over bearing or overly shy or nervous. This is a common trait of the breed despite popular belief they have a “hard temperament” which implies they are dominant towards people. Some individuals are dominant. The majority of individuals are submissive in their nature towards people. Especially their people. Animal aggression. Animal aggression, especially dog aggression is common with the breed and should be considered normal. Abnormal dog and animal aggression should be dealt with quickly by seeking out a professional to help. Some Pit Bulls are “off the hook” when it comes to their aggressive behavior towards animals. In my opinion, this behavior is not normal of the breed as a whole and is not that common unless reinforced by people. Highly intelligent. I like to say they can think on their feet. 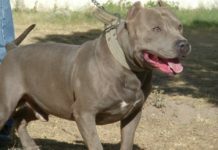 Because a proper Pit Bull will learn new obedience behaviors, tricks and even bad behaviors quickly without much effort. Their energy for learning new things is almost unstoppable. High Energy. This is not true of all Pit Bulls. However, as a breed, the majority of individuals are packed to the rim with an abundance of energy. Lots of long walks and hard exercise is the order of the day for a Pit Bull owner. While I could list 10-15 more traits of a proper temperament these make up the core of a sound American Pit Bull Terrier. Human aggression in the Pit Bull is rare. Those individuals who show this trait should be eliminated (put to sleep). 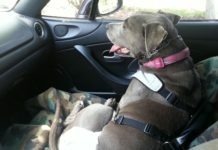 There is simply no room in our world for a Pit Bull that bites people or is capable of biting people. Breeders, wait, puppy sellers, wait, morons, who sell dogs that are unstable biting freaks are abundant these days and their dogs show their immoral, misguided, lack of canine knowledge, actions. While Pit Bulls do work in protection sports (the key word is SPORT) on a whole they make horrible real situation protection dogs. This is a result of their natural willingness to be friendly towards all people. In short a human aggressive Pit Bull is a Pit Bull that should be put to sleep. No exceptions. 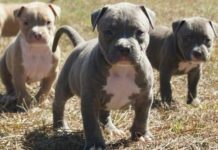 Proper Pit Bulls (American Pit Bull Terriers) are eager to please their people, they love just about everyone, and combined with their high energy are great dogs for an active owner or active family. They are not protective by nature as many people believe. I got into an altercation a few years ago with two men on the street who threatened me and were going to try and steal my girls. I dropped their leashes and as I was locked in a fight with both of them they ran home (this happened about 100 yards from my house) and I found them hiding under my truck. This is a typical scenario. Dogs are not naturally protective for several reasons. First, they are submissive to you (the alpha) who is supposed to be the top dog. The top dog is the one who protects them from trouble. Not the other way around. This is natural canine behavior and the Pit Bull is no exception. In the end, a proper Pit Bull will love you, excel at just about any sport or activity you get involved with, and burst at the seems with life every day their eyes are open. If you are not willing to give them that kind of life, a high energy life full of activity, then please, choose another breed that better suits your lifestyle.